The first icewine grapes of the 2011 season, at least that I am aware of, were picked Thursday morning when temperatures dropped below -8 in the vineyards of Henry Pelham. Picking and crushing crews, along with winemakers and lab techs, were summoned to the winery around 1 a.m. to bring in the harvest, about 40 tonnes of frozen riesling, cabernet franc and vidal grapes, and crush it into juice to make the famous icewines that Canada is known for around the world. When I visited the winery later on Thursday afternoon, Henry of Pelham winemaker Ron Giesbrecht was just finishing crushing the riesling grapes and was moving into the cabernet franc grapes, still frozen and ready for the press. 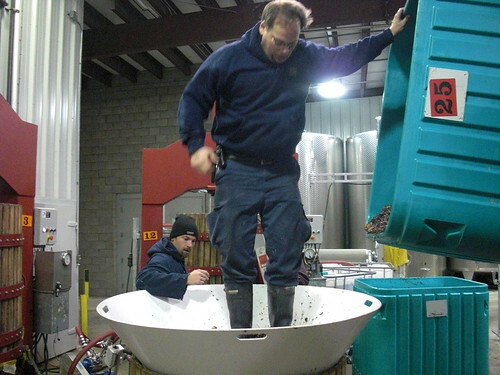 Henry of Pelham uses one-tonne backet presses that crush about a tonne of grapes in two to three hours. 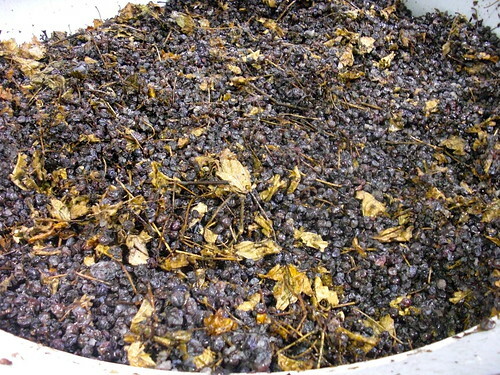 The harvest was relatively small this year, about 40 tonnes compared to 80 tonnes the previous vintage and far off the record-setting 2007 vintage that saw over 100 tonnes of icewine grapes harvested. Giesbrecht was happy to finally get the harvest into the winery as the grapes start falling off the vine into to January and February. He said the market for icewine “tends to be volatile” as the customers are primarily from export markets. There are significant sales through the LCBO and at the winery but it’s at the duty free shops where wineries measure their success for icewine sales. Here are some photos from today’s crush at Henry of Pelham. 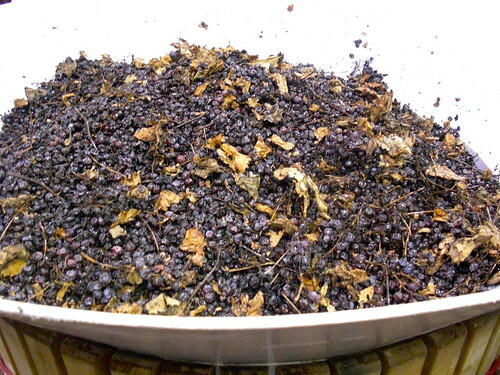 We will have a better picture of the crush from a post by Melissa Smits, a cellar/winery technician at Henry of Pelham Family Estate, in the next couple of days. There is also a full press release from Henry of Pelham following the photos below. 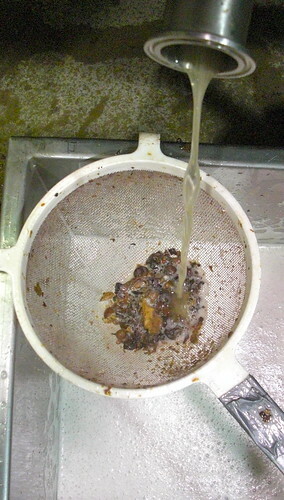 A load of cabernet franc icewine is put into the basket press for crushing. 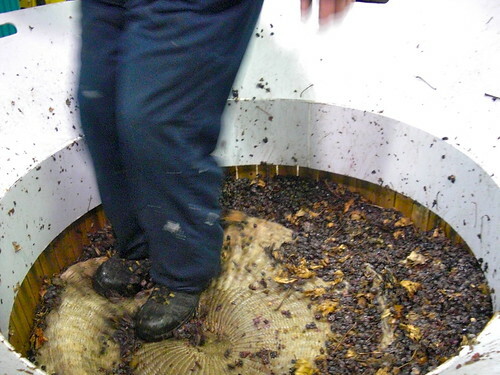 A cellar worker stomps down the frozen grapes to make room for more in the basket press. 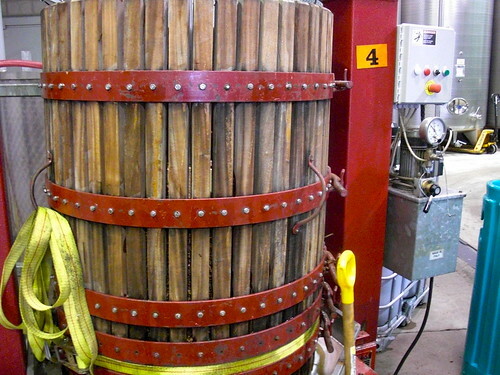 The one-tonne basket presses used to crush icewine grapes. 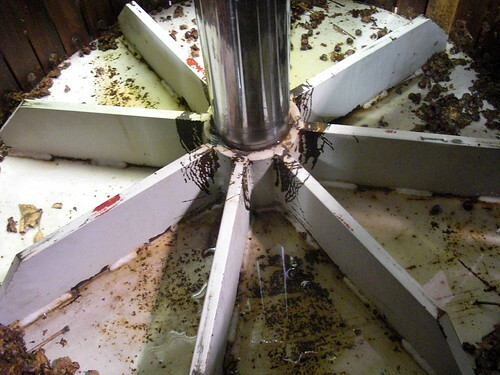 A cone is used to funnel the grapes into the press. Winemaker Ron Giesbrecht, by the ladder, overseeing the stomping of the grapes. 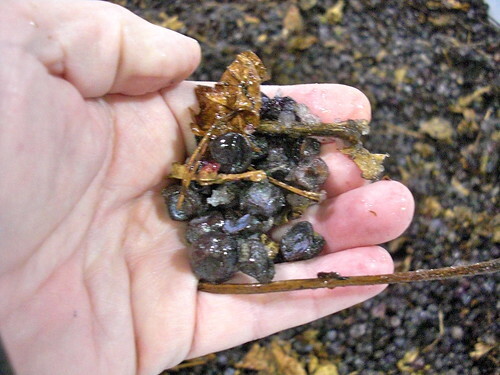 What the cabernet franc icewine grapes look like before being crushed. 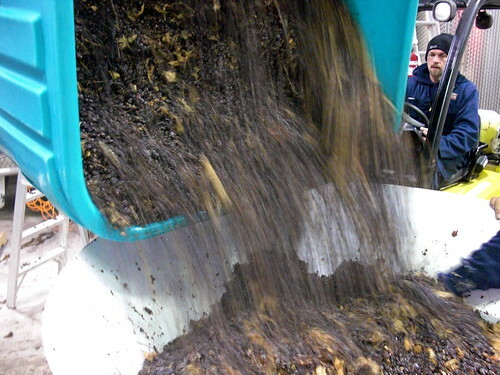 Riesling icewine juice after being crushed. Closeup look at the frozen caberent franc grapes. From the top of the basket press looking down as the frozen grapes slowing get crushed. The Icewine harvest has officially begun in Niagara this morning as picking began at Henry of Pelham Family Estate winery as temperatures dropped below -8 Celsius, the audited temperature for VQA rules. Riesling Icewine is being picked first as the skins are very thin and the grapes need to come off the vine as soon as possible. Nets are used to cover the grapes and protect them from the birds, deer and turkeys as the extremely sweet and ripe grapes are the only food source available. Wine grapes are 85% water. When they naturally freeze on the vine the sweet nectar is pressed to produce this rare and delicious wine. Henry of Pelham is an independent family owned winery who have made award winning Icewine since 1989. This vintage will be available in wine stores worldwide in the fall of 2012. The Icewines available now herald from the 2010 vintage. Icewine is enjoyed as a dessert or in cocktails such as Icewine cosmopolitans. It is enjoyed on release but can age for well over 10 years.